Dec. 12, 2013 7:00 p.m. 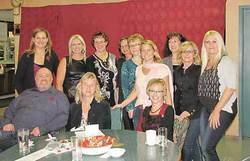 The Wetaskiwin Kinette Club held its 15th Annual Cystic Fibrosis Auction with a goal of raising $10,000 to bring the grand total for all 15 auctions to $100,000. During the fun evening they raised $9,805, but have a firm commitment for another large donation which will bring the total well over their goal. Gerald Zimmerman conducted the live auction of the three butlers for the evening, the approximately five dozen donated items, and more than a dozen surprise bags worth a minimum of $15 each. There were also several dozen silent auction items. The guest speaker for the evening was Heather Hanna, a twelve year old girl who has cystic fibrosis. Her father, Scott Hanna, the President of the Edmonton and Alberta Chapter of Cystic Fibrosis Canada, accompanied her and also spoke briefly. As an example of the amazing strength demanded of those having the disease, he told of an incident that occurred when Heather was about three and a half. She was on a regimen which required inhaling an antibiotic for half an hour, then two hours of therapy for a month, then two weeks off the antibiotic. At one point she had to start a two month period on the antibiotic, which stung as she breathed it in, so was very uncomfortable and even painful. When she was to start the two months, she was crying and ran to the bathroom where she pulled out her stool, stood on it, looked in the mirror and said to herself, “I've done this before. I can do it again.” During her talk, Heather asked everyone to breath through the small size drinking straws at each table so that they could feel what breathing is like for those with cystic fibrosis. Her closing words were, “Your participation in a fund raiser like this means so much to me.” Heather has a fraternal twin sister, Marie, who is clear of the disease and looks out for Heather. Kin Clubs, an all Canadian service club, has raised over $40,000,000 for cystic fibrosis research since it began the partnership in 1964. This has contributed considerably to making Canada a world leader in cystic fibrosis research. The gene causing cystic fibrosis was identified at the University of Toronto. The life span of patients with cystic fibrosis in Canada has gone from a maximum of five or six years in the 1960s to only half dying under the age of 26, to half of Canadian victims of the disease now making it to 40 years of age, the longest survival rate in the world. For a long time, the only available treatment could only attack the symptoms, the abundant very thick, very sticky mucus produced in the lungs and digestive tract. The mucus had to be cleared out of the lungs to allow breathing, a therapy which involved thumping the back of the rib cage with the upper body sloping down, so that the mucus could be loosened and coughed out. When Heather was “healthy,” her therapy required a couple hours per day, when she had a cold, it was about five hours per day, and when she was sick, it went up to seven or eight daily hours. Medications were developed to thin the mucus in the digestive tract so that nourishment could be kept down and absorbed. However, Heather is one of a lucky three per cent who are helped by a new drug, made available in January of 2013, which reduces the symptoms, reduces the production of that thick,sticky mucus. Since starting the drug, she hasn't been sick, her lungs have been clearer, she gained 20 pounds in two months, she has higher energy levels, and is happier and healthier so is approaching a normal life. The Hannas are fortunate to have supplemental health insurance for the $300,000 per year cost of the drug. Also at the Kinette Cystic Fibrosis Auction was Patrick Dower, the Kinsmen District Governor, over 76 Kinsmen, Kinette and mixed Kin Clubs in Northern Alberta and the couple in B.C. He said that Kin Canada supports STARS as well as cystic fibrosis research, and also has goals of personal growth and fun. Clubs are active in service in their communities and have courses providing training in various areas such as public speaking. Each club has a particular niche in its own community. Kin Canada is the largest all-Canadian service organization. While the Kinsmen Club is not currently active in Wetaskiwin and has sold its clubhouse, the Kinnetes remain strong and actively involved in a number of projects.